Yang's Exit: Did Yahoo! 's Chief Get Played by Google? 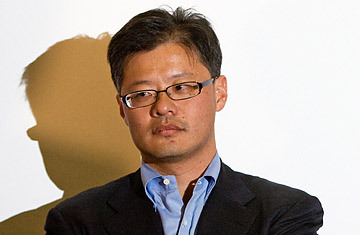 The announcement that Jerry Yang will step down as CEO of Yahoo! was welcome news to investors still seething that the founder turned down an acquisition offer from Microsoft earlier this year worth some $46 billion. (After Yang demanded $4 more per share than Microsoft's offer, the software giant walked away.) Yahoo! is in trouble  its stock price has fallen to around $11 from $29 in February 2008 and it's way behind Google and others in the fast-moving Internet innovation game. (The stock rallied slightly upon news of Yang's departure.) Yang, who took the job as CEO in June 2007, 13 years after he founded the company, said he'll stay on as chief executive until a replacement is found.  He was was born in Taiwan in 1968. His father died when he was a toddler and his mother, an English professor, moved with her two sons to the U.S. in 1978. According to published reports, the only English word that Yang and his younger brother knew when they arrived in America was "shoe." The family eventually settled in San Jose, Calif.
 Yang graduated first in his high school class, while also finding time to play tennis and serve as student body president. He got his bachelor's and master's degrees in electrical engineering at Stanford in four years, while working part-time jobs to make money. Yang stayed on at Stanford to get his doctoral degree, but because he left school to start Yahoo!, he never finished.  While attending a six-month Stanford program in Japan, Yang met his wife Akiko Yamazaki, who was also a Stanford student. They have one child.  Yahoo! started as a project between Yang and fellow grad student David Filo, who started a listing of their favorite web pages in 1994. (Yang had also tried designing web pages, including one devoted to sumo wrestling.) Yang and Filo initially called the service, which was used mainly by their friends, "Jerry and David's Guide to the World Wide Web." The two eventually changed the name to Yahoo!, claiming it was an acronym for "Yet another hierarchical officious oracle."  Yang and Filo incorporated Yahoo! in 1995, secured venture capital and eventually took the company public in 1996.  Yang owns a 4% stake in Yahoo! At one point, the company was worth as much as $130 billion; it's currently valued at about $15 billion.  Earlier this year, Forbes estimated Yang's total net worth at $3.2 billion.  As Chief Yahoo and currently as CEO, Yang accepts only a $1 annual salary from the company.  "When we argue, Akiko says I always have the advantage because English is my second language but it's her third language."  "We have a very clear strategy in place and we are executing on it...I very much see the CEO role as something I plan to do for a while."  "We got made fun of a lot at first. I didn't even know who the faces were on the paper money."  "After meeting with the families, it was clear to me what we had to do to make this right for them, for Yahoo, and for the future."  "All of you know that I have always, and will always bleed purple."  "He's everything from technical visionary to chief strategist to corporate spokesman and cheerleader to Washington lobbyist to the company's conscience."  "It took a tongue-lashing from Congress before these high-tech titans did the right thing and coughed up some concrete assistance for the family of a journalist whom Yahoo! had helped send to jail...What a disgrace."  "In my opinion, you might have to get rid of Jerry and part of the board to bring back Microsoft."